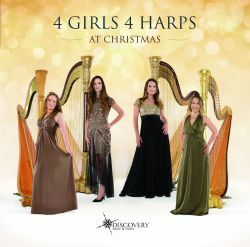 "This will blow away the cobwebs - sparklingly energetic arrangements for four harps of favourite carols. The '4 Girls'...do the arranging themselves, with versatility and imagination...Ensemble is watertight, and there's a real rhythmic elan to the playing which keeps you listening." This CD presents exciting new works alongside transcriptions of classic pieces which shows off the full scope of four concert harps. For centuries, the harp has been associated with heaven and angels. There are many beautiful images depicting angels playing golden harps, often adorning stained glass windows, Christmas cards, and as decorations on the Christmas tree. December is one of the busiest months in a harpist�s calendar. From the harp solo in Tchaikovsky�s ballet �The Nutcracker�, to Benjamin Britten�s �A Ceremony of Carols� for choir and harp, the warm, sparkling tones of a harp really help to make the festive season even more special! It was their love of Christmas, and the exquisite music associated with it, that inspired them to create this collection of their favourite carols and arranged them in a variety of styles. From traditional choral anthems, to rustic folk influences and jazz harmonies, each carol has been carefully selected. For centuries, the harp has been associated with heaven and angels. There are many beautiful images depicting angels playing golden harps, often adorning stained glass windows, Christmas cards, and as decorations on the Christmas tree. December is one of the busiest months in a harpist�s calendar. From the harp solo in Tchaikovsky�s ballet �The Nutcracker�, to Benjamin Britten�s �A Ceremony of Carols� for choir and harp, the warm, sparkling tones of a harp really help to make the festive season even more special! It was our love of Christmas, and the exquisite music associated with it, that inspired us to create our own collection of carols. One of the most exciting parts of being such a unique classical ensemble is the opportunity to �borrow� music from other instruments, to arrange for four harps. For this album, we have chosen a selection of our favourite carols and arranged them in a variety of styles. From traditional choral anthems, to rustic folk influences and jazz harmonies, each carol was selected because it meant something to one of us and, quite simply, because we loved how it sounded. We hope that you will enjoy listening to them as much as we have enjoyed writing and performing them.